As expected he didn’t go in the first round. How far will he fall? Some teams won’t even consider drafting him in the top-50. He won’t last until pick #63 but if he gets beyond #50 — watch out for the Seahawks trading up. It’s hard to place a team before the 49ers who would consider taking him. Can Seattle work out a deal with Minnesota picking just ahead of San Francisco? Will someone else move up to take him? He looks like the best remaining option for the Seahawks — but can they get into range? Another player the Seahawks would probably have to go up and get. He’s not a 1.50 split rusher like Cliff Avril and Bruce Irvin but he’s pissed off to be great and explodes off the snap. He’s a little boom or bust at times but he’d fit right into Seattle’s scheme, rotation and identity. Intense in a good way. Compares himself to Bruce Irvin. Unlikely to fall much further with teams at the top of round two hunting for offensive line help. He would provide athleticism and left tackle potential, even if his best fit immediately is at guard. Tenacious interior pass rusher who can get into the backfield but also plays stout against the run. More of a Jordan Hill type than a Brandon Mebane. Some people have him in the early second round, others in rounds 3-4. Michael Bennett style rusher but a little inconsistent at times. Flashes a disruptive edge and has the potential to cause havoc. Then he’ll go quiet for a half. He has an enticing combination of size and athleticism — but do they need another Bennett? Will be an option for 3-4 teams looking for an athletic D-end as well as teams trying to find a power DE for the 4-3. Three-technique convert if he lands with the Seahawks. He had an official visit to Seattle which is intriguing. Tape is pretty poor but if he can stay in the 280’s and find a role inside there’s something to work with. Certainly one to watch anyway. There are still teams with a need at cornerback and you’d expect Rowe to be next on the hit-list. Jalen Collins is a better player with greater upside but Rowe has none of the character red flags. He also has experience at safety. Chunk play specialist and a key special teams gunner. Can make the big play downfield but does suffer the occasional concentration lapse over the middle. Plays above his size, has a little OBJ to his catching style. Lacks OBJ’s massive hands and superstar ability, mind. He could be the first pick in the second round. The only thing that’ll force a fall is a lack of polish and experience on offense. In terms of upside the sky’s the limit and he’s unlikely to make it anywhere near Seattle’s pick. Almost identical size to Max Unger and performed admirably at left tackle for Mizzou. High character, tenacious and born to block in the NFL. No slouch in terms of athleticism. A gradual riser during the draft process and probably won’t be available when Seattle is on the clock in round three. Again it comes down to how far he drops. He’s a brilliant prospect with bags of potential. Without the character concerns he’s a sure-fire top-20 pick. Long, fast, competes for the ball and a brawler. He’d be a perfect fit for the LOB in terms of playing style. In the late second round his value might be too good to pass up. Not too dissimilar to James Carpenter. People will groan at that — but Seattle seems to have a ‘style’ at left guard. They like tackle converts with massive size and length. Smith looks like a guard on tape but they might be tempted by his experience on the blind side. Russell Okung is out of contract next year. Like Smith he’s a tackle convert with size and plus athleticism. His personality is similar to John Moffitt’s. He visited with the Seahawks and worked out at center, so he has some flexibility. Just a solid player with a lot of upside who would likely start at left guard. The Seahawks worked him out this week. Why so late in the process? He’s worth a look considering the tape doesn’t give much away. How does he compare to some of the other prospects in this class — or Lemuel Jeanpierre and Patrick Lewis? Can he develop from small school standout to established pro? Massive size and great mobility combine to create a tantalising prospect. He has hit and miss tape but the potential is there. He can do back-flips at 329lbs, runs in the 5.1’s and has nearly 35-inch arms. He’s not the finished article but he could be very special. I could add others. I’m not convinced the Seahawks will look hard at Jaelen Strong (WR, Arizona State) and what’s happening with La’el Collins (T, LSU)? They are two names I’m sure people will ask about. Any of the mid-to-late round options we talked about could also be in play. Teams started reaching to take guys they like at the bottom of round one. The Seahawks, if they stay at #63, are more than likely to do the same. That could mean anything — a random defensive pick, a receiver like Tre McBride, one of the athletic or big offensive linemen we’ve discussed. Don’t be surprised by anything. If they stay at #63, you almost expect an obscure pick. However, the options above provide a real opportunity to move up. The first name to watch is Dorial Green-Beckham. He isn’t the only player Seattle will consider moving up for though — they could be interested in several defensive prospects and offensive linemen too. Join us from 4:30pm PST for live coverage of the NFL Draft’s first round. Turn the volume off ESPN and the NFL Network and get your analysis with a Seahawks slant. We’ll be back tomorrow to cover the second and third round. What’s going on with Bruce Irvin & the Falcons? Is Bruce Irvin trying to force a move to Atlanta? Last month reports emerged suggesting Michael Bennett wanted a trade to Atlanta. Last night it was the turn of Bruce Irvin. Mike Florio says “chatter” among league sources pointed to a deal being possible to send Irvin to the Falcons. Danny O’Neil initially backed up the report, then somewhat dismissed it. I understand the Bennett/Falcons stuff had some legitimacy. Ditto the new Irvin reports. I suspect the Falcons want to bring in a veteran, proven pass rusher — freeing up the opportunity to go offensive line in the top ten. Atlanta’s offensive line has been poor for a while. The addition of Jake Matthews did little to improve the situation last year. Several reports are suggesting the Washington Redskins are preparing to draft Dante Fowler Jr — rather than trade down with a team like Atlanta hoping to take him. The Falcons could turn their attentions to Brandon Scherff at #8 or even Andrus Peat. Another factor at play — there isn’t a natural LEO in this draft. Nobody who runs a 1.50 10-yard split like Cliff Avril or Bruce Irvin. Nobody with that electric speed and length. Nobody who is an ideal fit for the role. In my last mock draft I had the Falcons taking Bud Dupree. Not as a LEO — as a flexible linebacker similar to Irvin. Instead they might be using their second round pick (or later picks) to bring in a veteran rusher. That brings Scherff and Peat into play. If a deal is going to happen, the Falcons would have to take an O-liner with their first round pick tonight. If this happens, it could make for an interesting Thursday night/Friday morning. Irvin is 28 this year and if the Seahawks choose not to take up the fifth year option on his contract, he’ll be a free agent in 2016. They drafted Kevin Pierre-Louis a year ago and he could move into a starting role. It could also allow them to target another edge rusher in the early second round (Eli Harold? Shane Ray? Preston Smith?) or Dorial Green-Beckham. However, such a deal still seems pretty unlikely. It’s also unclear whether the Falcons would even be willing to give up an early second rounder. There are two players in Seattle — Bennett and Irvin — both wanting more money, both sensing an opportunity with Dan Quinn in Atlanta. Will the Jaguars draft Todd Gurley? Could Todd Gurley be a surprise top-five pick? Last year the Jacksonville Jaguars caused a stir by drafting Blake Bortles with the #3 pick over Sammy Watkins and Khalil Mack. Now it’s presumed they’ll take Amari Cooper, Dante Fowler Jr or Leonard Williams. They could take Cooper to aid Bortles’ development. They did, however, draft two receivers in the second round last year and bring in Julius Thomas in free agency. They could take Fowler Jr. to work the edge. They also had the sixth best pass rush in terms of sacks in 2014. They could take Williams — but didn’t they already fill that role with Jared Odrick? All three players could be in play. They appear to be a consensus ‘top three’ on most boards anyway. But if the Jaguars do provide a shock (again) — could it be Todd Gurley? Ideally they’d trade down a few spots first but if they can’t, maybe they just take him? He’d provide a dynamic backfield option to take some of the pressure off Bortles. Gus Bradley knows full well how a tone-setting franchise back can benefit a team. #5 Washington — Dante Fowler Jr. Without the ACL injury Gurley would’ve been talked about as a sure-fire top-ten pick. With positive news about his knee emerging recently, he could still go in that range. It’ll be a surprise if it happens. It probably shouldn’t be. Don’t forget to join us for our live Google Hang Out this evening throughout the first round. The big question is whether the Buccs trade back into the first for a left tackle. It’ll only cost a later round pick. A couple of weeks ago it seemed nailed on this pick would be traded. Instead Tennessee faces a situation where they end up taking Mariota. They ranked sixth in the league for sacks last season. Gus Bradley can manufacture a pass rush. They need to build around Blake Bortles. Is Todd Gurley an option? With Cooper off the board this could be an easy choice. Keep building up the defensive front and take a receiver at the top of round two. Cornerback is a big need and they could move into the teens before looking at Byron Jones, Marcus Peters or Kevin Johnson. If they stay here, Fowler Jr should be the guy. They’ve brought in Brandon Marshall and the defense is based around strong secondary play not outside linebackers. Improving the O-line might be the priority. If Kevin White falls to this spot they can snap him up and concentrate on defense in round two. Dupree could fill the Bruce Irvin role for Dan Quinn. An athletic linebacker who lines up at the LOS on passing downs. A prototype left tackle on tape. He doesn’t have a classic body shape but he looked the part at Stanford. He’s very underrated. Flowers is nasty — he drives people off the line. He’s big and physical. He’s a better prospect than Anthony Davis was in 2010. The Bengals drafted multiple first round corners for Mike Zimmer and the Vikings could use a similar approach. Waynes is a nice fit for the scheme. Cleveland’s offense looks like a sorry mess. If they can’t trade up for Mariota, what is plan B? Surely they’d have to consider one of the receivers here? Beasley’s still on the board and the Saints need a pass rusher. Perfect fit. They seem to want an impact player on offense. Gurley is one of the best players in the draft — a top-ten pick without the ACL injury. He could still go in that range. There’s still a big question mark over whether Justin Smith will retire. Even if he continues, it’s probably only for one more year. They moved on from Andre Johnson. Perriman isn’t the same sure-handed, reliable target. But there’s a physical comparison at least. Melvin Gordon will be tempting but Shelton fills a vital need for the Chargers at nose tackle. The top four receivers are off the board so they look elsewhere. O-line is just as much of a need. Collins can play guard or tackle. After taking a receiver at #12 they know they need to bolster their defensive line. Brown is a terrific prospect. He’s the fast riser in this class. Randall has a nose for the ball and the athleticism to become a rangy free safety. Fisher’s strong combine and legit upside makes him a tantalising prospect. The word is Cincy are keen. There’s a feeling Pittsburgh will go corner here. They’ve avoided character red flags in round one over the last few years. It’s a big need and Erving is just a really solid, multi-year starter at center. Run to the podium time. Gordon isn’t just a dynamic runner — he’s a heart and soul type who sets the tone during the week. They have to find a tackle but value wins out here. Agholor perfectly compliments Kelvin Benjamin and provides a safety net for Cam Newton. Peters would be a fine addition for the Ravens. This is an ideal fit for player and team. Tough, skilled and ready to make an impact. With Peters off the board and Shane Ray falling out of the first round, McKinney comes into play. He’s similar physically to Rolando McClain. The offensive line is likely to be the priority and Ogbuehi is expected to find a home in the late first round. The Colts need to keep improving on defense and Collins is good value here. An instant starter who can hit and cover. They could move down with teams looking to get a tackle or Phillip Dorsett. If they stay put — inside linebacker or cornerback appears to be the target. Smith adds further power and speed to New Orleans’ new front alongside Vic Beasley. Arguably FSU’s best player in 2014. Capable of rushing the passer but particularly stout against the run. Clemmings has enormous potential as a right tackle. Protect Marcus Mariota and get a running back to pound the rock later on. The Buccs could consider moving back into the first round to get a tackle. They need to protect Jameis Winston. They went after Randall Cobb and Dorsett is a similar type of player. They could move into round one to make sure they get him. They get their LEO rusher to work the edge with this pick. Harold has massive potential. Somebody will stop the fall eventually. Ray isn’t the perfect scheme fit for New York but he gets after the quarterback. Jones has the potential to go so much earlier than this. Flawless character, insane athleticism. What a steal for the Redskins. A really solid pick as they look to build a new defense. Kendricks makes tackles and flies around. The Giants move him inside to the three technique and address a big need. The Rams have needs at every offensive line position. Cann fills a hole inside. The Falcons need help at guard. Tomlinson is a high character, hard working player with plenty of upside. Not the biggest or fastest player but he brings a high level of intensity and can start immediately. Another defensive need filled. The Saints become even stronger up the middle with the addition of Anthony. He flies into the backfield like a three-technique but he’s stout enough to be a nose. Really fun player to watch. The top linebackers are off the board. They could and probably should move up for one in this scenario. If not, DGB faces the LOB twice a year. He starts at guard but could eventually move outside to tackle. Sparky running back who can be a threat in the passing game. It’s a nice match with San Diego’s offense. There’s some DeSean Jackson to his game. Andy Reid puts him next to Jeremy Maclin and tries to find a spark in the passing game. The Bills need to keep adding to their offensive line. Sambrailo is versatile and can cover a number of different positions. This feels very low for a huge athletic mountain. If he lasts this long the Texans won’t believe their luck. They still have a need at the position and Strong could provide an outside threat for Chip Kelly. They like these smaller receivers. Lockett was a production machine in college, he has terrific character and he’s a kick returner. He’s athletic enough to compliment what they already have. A true home-run hitter. The Cardinals reach a little bit to fill a need. Orchard isn’t quick but he’s technically adept. Great length and a superb combine. He can be more than just a great run stopper at the next level. The options at tackle are all gone so they take a corner instead. They need some size up front after trading away Haltoi Ngata. He had a poor combine but on tape he just makes plays. The Broncos have a need at inside linebacker. Physically he compares well to DeMarco Murray. Could he fall further than this? Sure. A broken foot, lack of starts and some off-field flags could lead to a fall. He just seems like a great fit. Plays tough, reliable, safe hands, slightly cocky attitude. Doesn’t get beat and has almost identical size to Max Unger — Seattle fills the hole at center. He can play as a hybrid receiver/joker TE for the Patriots. I didn’t include trades in this mock. By the time Seattle’s on the clock, many of the top receivers and defensive players are off the board. I had them take the best offensive lineman available. Mitch Morse is the pick. He competes for a start with Patrick Lewis and Lemuel Jeanpierre in camp and likely wins the job. He has almost identical size to Max Unger. He doesn’t get beat. It’s a solid, long term investment at the center position. Several other O-lineman are off the board — including possible targets Ty Sambrailo and Donovan Smith. Could Seattle move up in this scenario? Sure. Dorial Green-Beckham is off the board too soon to expect a fourth round pick to get the job done. If he fell any further, he comes into play. Defensively Jalen Collins is tantalisingly close to #63. Depending on how you feel about his character, you’d almost have to show a degree of interest there. Collins has incredible potential. I wouldn’t expect the Seahawks to show interest in moving up for Jaelen Strong. There are a few others that could be targeted via trade if they fell. A lot of those players go in the first part of round two — such as Eli Harold. What about the rest of the picks? If they go Morse at #63, they could look at Frank Clark in round three or Tre McBride. Chris Conley can’t be ruled out, possibly in round four. I think the interest in Mike Davis is legit and I still believe Ty Montgomery is going to be drafted by the Seahawks. Josue Matias could be brought in to play guard and I’d be very interested to see where Rob Crisp lands. Don’t forget tomorrow we’ll be broadcasting live throughout the draft. Listen along for analysis with a Seahawks slant. I also want to thank the community here for another great year of draft talk. There’s no bickering, no drama. Just a bunch of people debating the draft. You are all first round picks to me. Here’s my best guess at where the Seahawks will target certain positions, what their priorities will be and which players they might covet. Trade up for a receiver, stay put and take a wide out or simply draft the best offensive lineman available. The three biggest needs are all on offense and should be in play with Seattle’s first pick in the draft. You don’t rule out a defensive pick here — and the lack of depth in the middle rounds compared to receiver and the O-line makes it a possibility. Seattle’s meeting with Florida State’s Mario Edwards Jr. makes things interesting. However — the Seahawks retain the vast majority of a league-leading #1 defense. Their biggest loss — Byron Maxwell — has been replaced by their biggest free-agent acquisition (Cary Williams). They added depth to the defensive line with Ahtyba Rubin. The only hole left to fill is a replacement for two-sack O’Brien Schofield. Jimmy Graham provides a much needed X-factor to the offense but there are still gaping holes at left guard and center. Graham’s arrival also shouldn’t prevent the Seahawks adding more talent at receiver. Jermaine Kearse is a free agent next year and Doug Baldwin’s contract expires after the 2016 season. Will Paul Richardson make a full recovery from his latest knee injury? There’s no saying Chris Matthews or Kevin Norwood will amount to anything. There aren’t currently any long-term pieces here. A defensive pick probably only happens if a very highly coveted player drops into range for a move up. The Seahawks have been pretty consistent though in addressing needs first, taking ‘their’ guys and not responding to the unexpected. Could LSU corner Jalen Collins fall? He has a broken foot and some other off-the-field issues. I think it’s unlikely he drops to #63 considering Janoris Jenkins only fell to #39 in 2012. The likes of Clemson’s Grady Jarrett and Edwards Jr. are likely to be gone too. This feels like it’s going to be a pick for the offense in round two, unless of course that highly coveted player falls. It’s as if the Seahawks have been planning to trade up for some time. Having lost out on an early fourth rounder when the Jets cut Percy Harvin, they quickly acquired another from New Orleans. There is a drop-off in talent at around pick #48-52. That extra fourth round pick gets you into range. There are two realistic trade-up scenarios. The Seahawks can move up 10-12 spots by trading their earliest fourth round pick (the one acquired in the Jimmy Graham trade). Philadelphia made a similar move last year to draft Jordan Matthews. Detroit at #54 seems like a viable trade-partner — they have picks in rounds 1-3 and then nothing until round six. If they want to move up even further — possibly into the 40’s — they could consider trading the same fourth round pick and also their 2016 third rounder. It’d be a bold move — but they will receive a third round compensatory pick next year for Byron Maxwell. That would soften the blow somewhat. Forget smokescreens and all of that — by now we have a pretty good idea the Seahawks have interest in Dorial Green-Beckham. Tony Pauline’s recent report validates that and there’s no need to second guess it. He’d be an ideal outside receiver with the potential to be that true #1 Russell Wilson hasn’t really had as a pro. Imagine putting DGB and Jimmy Graham on the field to compliment the running game. That’s why we can’t rule out a slightly more ambitious trade. You might balk at the price. There aren’t many moves Seattle can make in this draft that’ll have a dramatic impact in 2015. This is one of them. They’d have a legitimate chance to field an offense as potent as the defense. And they’d still have nine more picks in the draft to fill other needs. If Green-Beckham goes too early (late first, very early second) there’s not much you can do. I highly doubt they’d be willing to trade a future first or second rounder. In that scenario, you accept defeat and move on. There aren’t many alternatives at receiver for the #63 pick. Devin Funchess provides similar size and mismatch value but he lacks DGB’s speed and upside. Tyler Lockett is a fiery, gritty receiver with major production and great bloodlines. Do they want to add another smaller receiver with an early pick? Or will they target someone like Ty Montgomery later on? Could they make a bit of a surprise pick like Tre McBride or Chris Conley? You can’t rule it out. Why would you? Look at Justin Britt a year ago. They’ll take their guys instead of risking missing out altogether. That’s likely to be their position on the offensive line too. If they can’t find a receiver at #63 they should be able to find an offensive lineman they like. Mitch Morse is a better tackle than people recognise. He doesn’t get beat. He’ll move inside to center — but part of the reason he’s rising so much is the way he performed at tackle at Missouri. Seattle will likely have one chance and one chance only to draft him — and that’s at #63 (unless they move down a few spots — but only a few). Ty Sambrailo gives them the best shot at a guard for today who could be a tackle tomorrow. Russell Okung’s contract ends after the 2015 season. Sambrailo is a better fit inside but he has the quick feet and the mobility to give it a go. Seattle has to consider possible Okung replacements. For that reason Donovan Smith is an option. He has the length and size to play tackle. The problem is he has the game to be a guard-only. His tape, for example, doesn’t even get close to James Carpenter’s at Alabama (where he played left tackle). He’s had difficulty with conditioning too, which is surely a turn-off after all the issues with Carpenter, Michael Bowie and now Alvin Bailey. They could also plug in a pure guard like A.J. Cann, Tre Jackson or Laken Tomlinson. If they don’t take a receiver in round two, this could be the range where they go for it. Is one of McBride or Conely still on the board? Part of me feels if they don’t get a big wide out in round two they might just pass altogether. Seattle has enough developmental receivers and really needs an injection of pure class. An impact player. Not a raw-with-upside type who spends most of the year inactive ala Kevin Norwood. Georgia Tech’s Darren Waller compares physically to Vincent Jackson. They had almost identical combine performances. It took Jackson four years to have an impact in the NFL — and Waller looks like a late developer. He doesn’t play with Jackson’s intensity either. Can you afford to sit and wait for a player like this? Seattle’s is bang in the middle of a Championship window. Dezmin Lewis receives some attention — but he ran a 4.58 at 214lbs at the combine and jumped only a 33.5 inch vertical. He improved both tallies at his pro-day (as is the norm). How athletic is he? And coming from Central Arkansas, how long is he going to need to get up to NFL speed? If they don’t go O-line at #63 it’s an option here too. Yes — there are nice options throughout rounds 4-5 (more on that later). However, this late third round pick gives the Seahawks a chance to ‘jump the queue’. That’s especially important if they traded up in round two using the early fourth rounder. We’ll run through some of the names in a bit — but if there’s an O-liner you have to have, this could be a valuable pick. Don’t rule out a running back — either here or in round four. Marshawn Lynch could retire after this season. Robert Turbin is a free agent. Christine Michael has underwhelmed. A team that runs the ball as its core identity isn’t going to sleepwalk into 2016 thin at running back. This is a good class of runners. If they’ve identified one they like and the value fits — they might do it. People have scoffed at this suggestion in the past but it makes a ton of sense. Even if the pick ultimately only replaces Turbin next year, you’re making a significant cost saving. If the worst happens and you lose Lynch and Turbin, at least then you have Michael and a sophomore RB to compete. You’re not handcuffed into making an early pick at the position. Let’s not forget they drafted Michael as a ‘running back of the future’ in 2013, so they’re open to it. Mike Davis visited with the Seahawks. He’s not everyone’s cup of tea — but he catches the ball well, has a somewhat physical style and he’s a classic one-cut-and-go type. He’s a scheme fit. He’s graded anywhere from round three to the later rounds. He could be one of the players they make sure they don’t leave the draft without. Then there’s the defensive line option. This probably comes down to who’s left. Is Frank Clark still on the board? If so, he may be your O’Brien Schofield replacement. The options on the D-line only get thinner from here. Cassius Marsh returns from injury though and Schofield’s impact in 2014 was minimal. They’re unlikely to force anything and might be happy to add an athletic upside D-end later on (or even in UDFA). Whether the Seahawks pick two or three times in this round, they’re going to get at least a couple of role players. That’s all you can ask for on day three. There’s a host of offensive lineman they could target. I’ll probably miss out on some possible targets — there are that many. During Tom Cable’s time in Seattle they’ve always had size at left guard. I can see why people are projecting SPARQ’d out athletic linemen for the Seahawks — but I still think their left guard next year is going to be big. Not 300lbs big — probably more like 320lbs big. Oklahoma’s Daryl Williams could go in this range — a pumped-up team player with the size and length Seattle loves. Aside from Williams they might look at West Virginia’s Quinton Spain or Louisville’s Jamon Brown. One other name to keep an eye on — Florida State’s Josue Matias. He’s 6-5 and 309lbs (but he can play bigger) with the all important tackle experience. Tom Cable attended FSU’s pro-day. Was he looking at Matias, Tre Jackson or both? Matias could be their guy. There’s a ton of upside there. What about center? If this remains unaddressed, there are plenty of options. Shaq Mason looks like a very realistic possibility. Accomplished run blocker, very stout at the point. It’s hard to judge his pass-blocking skills in the triple-option but he has a lot of upside. Florida’s Max Garcia had an extremely impressive Senior Bowl and could go in this range. Kansas State’s B.J. Finney is a no-thrills, meat-and-potatoes type of blocker but he could be an early starter. Auburn’s Reese Dismukes is a good fit for a zone blocking team and could be available in the late fourth. San Diego State’s Terry Poole is a tackle convert who could work at guard or center. If drafting a possible replacement for Okung is a priority, they could even look at tackles in round four. Green Bay found their starting LT (David Bakhtiari) in round four. NC State’s Rob Crisp is long, athletic and severely underrated. Vic Beasley’s probably going to go in the top ten this week. Nobody in college football handled him like Crisp. Virginia Tech’s Laurence Gibson has similar length and athleticism. He only has one years experience as a starter — but he flashed enough to warrant consideration as a developmental left tackle. Whether it’s in round four or five — I expect Stanford’s Ty Montgomery to be a target. He’s visited with the Seahawks. He fits them like a glove. Incredibly competitive and smart. A driven character who lives for football. He can forge a role on the offense but more importantly — he’s a fantastic kick returner. He’ll have an impact in week one returning kicks, replacing fair-catch specialist Bryan Walters. Montgomery in Seattle seems like a perfect day-three match. We could start to see more of a defensive focus here. This is where they’re likely to pluck a tall, rangy corner to put on the production line. Stanford’s Alex Carter might be off the board, but Texas Southern’s Tray Walker passes the size/speed/length test. Oklahoma’s Julian Wilson has ugly tape (really ugly at times) but he too fits Seattle’s corner criteria. Penn State’s Adrian Amos will be projected by many to play safety. The Seahawks could consider him a flex option. There are likely to be one or two obscure targets too. When Frank Clark leaves the board they’re going to struggle to find explosive, physical pass rushers or ideal LEO’s. The closest thing might be Shaq Riddick — a victim of the bizarre three-man front at West Virginia that dogged Bruce Irvin’s final season with the Mountaineers. He’s tall and quick. He’d need some work. Watch Southern Miss defensive tackle Rakeem Nunez-Roches give Alabama fits and you can see why he might be a target. Tenn-Chat’s Derrick Lott is another to keep an eye on. At safety USC’s Josh Shaw and Michigan State’s Kurtis Drummond are possibilities — although it’s unclear how much of a need they have at the position. How highly do they rate Dion Bailey? Can they find another UDFA to replace Jeron Johnson? Georgia cornerback Damian Swann just finds a way to make plays. He’s a turnover machine who’s a good coach away from being a nice little project for someone. He only has 31-inch arms. Is it a deal breaker? Possibly. There’s at least a chance they’ll draft a quarterback at some point. Plucking an UDFA like Blake Sims possibly makes more sense than blowing a pick on a camp body. He could be a seventh round option. I could run through a list of athletic VMAC visits here as possible later round options. We all know they’ll focus on the SPARQ’d up remains of this draft later on and in UDFA. There’s no great skill in pointing at a list of names just because they’re athletic. You know what to expect. I’ll just link to this Chawk Talk piece that notes all the pre-draft visits. They’ll take a selection from that group. Tomorrow is podcast day. Wednesday the final mock draft. Thursday — you know what happens Thursday. Is Devin Funchess a possible alternative to Dorial Green-Beckham? Trade up for a receiver? Stay put? Draft the best offensive lineman on your board? Our conversations over the last few weeks have been dominated by these questions. This weekend, two different seven-round mocks highlight the possibility that Seattle’s front office will be having the same debate. Evan Silva and Josh Norris have put together a list of needs and a seven round Seahawks projection. Funchess is an interesting case. It’s logical to expect the Seahawks will target size. They already have one of the better slot receivers in Doug Baldwin. They’re likely to add a smaller receiver who can return kicks on day three (more on that later). Outside of one-game wonder Chris Matthews there’s a distinct lack of size on the perimeter. They went away from this last year, seemingly believing speed and the intermediate game would mesh nicely with their power-run attack. Let’s call it the ‘Percy Harvin blueprint’. When Harvin departed the Seahawks lacked the punch to make it work. Having already lost their best contested-catch maker in Golden Tate, they didn’t really have a red-line winner who could make the tough grab. The reported interest in Vincent Jackson before the trade deadline suggested a change in philosophy. In fairness to the Seahawks, nobody can argue they’re stuck in their ways. They’re willing to evolve. This probably doesn’t stop with Jimmy Graham. It’s not about one player, in particular a player who’s going to work the middle exploiting match-ups against linebackers. They need that taller outside threat — and they’re unlikely to thrust all their hopes solely on Matthews based on the Super Bowl. There’s a reason Tony Pauline is reporting interest in Dorial Green-Beckham and a reason why we’ve spent so much talking about him as a possible trade target. Seattle’s offense will always be run-first — but that puts more pressure on the passing game when you do throw the ball. With Baldwin in the slot, Graham working the seam and a dynamic big target outside — the Seahawks can finally field an offense as potent as the league-leading defense. If they can’t get into range for DGB — the closest alternative is Funchess. He’s slower, less sudden and has nothing like Green-Beckham’s upside. There are question marks about his drive at Michigan. He certainly underwhelmed. But he is a big target who can make plays downfield, box-out defenders and win contested catches. He’s making tough grabs, he’s finding ways to get open. He has a chunk play downfield. He looks good. We just didn’t see enough of this in college. He’s definitely a build-up speed runner but he can eat up space with long strides. He has one of the best head-fakes you’ll see, setting up a corner to the inside before a nifty little double move to create separation. If the Seahawks just want a big target they can work with, Funchess could be a consolation prize if DGB ends up elsewhere. He isn’t too dissimilar to Mike Williams. That might put you off — but clearly Carroll has time for that kind of receiver. The great thing about Green-Beckham is the rare gliding ability at his size and the YAC potential. He’s a downfield threat at a playing weight of around 225lbs. That’s insane. Funchess isn’t the same smooth athlete. He can go up and get a football though — and he has underrated ball-skills and the ability to work to get open. It’s an alternative option that could be a possibility at #63 or with a small move up the board. Make no mistake though — he’s no DGB. Is he ‘Seahawky’ enough? Is he the gritty determined character they want at the position? Or is he just a slightly passive big target without the offsetting speed and dynamism DGB provides? Norris has the Seahawks taking Frank Clark at the bottom of round three: “Clark is an outstanding athlete who flashes bend and a conversion of speed to power.” If you’re looking for an impact D-end in the middle rounds, Clark’s probably the best bet (if you can live with the character flags). You can see the mock for yourself but Norris also gives the Seahawks guard Mark Glowinski and center Shaq Mason in round four. My only question here — is Glowinski big enough? Seattle has used major size at left guard under Tom Cable. Ty Montgomery is also taken in round five. Increasingly Montgomery is being paired with the Seahawks. He’s tough and plays with grit. He can be more than just a kick-return specialist — although he excels there. Character wise he ticks all the adequate boxes and seems like he’d fit right into Seattle’s ultra-competitive locker room. I’d almost be surprised if he wasn’t taken in round four or five. Whenever they can get him. The Seahawks need a productive kick-returner who can contribute. Special teams is the one unit on the roster (kick returns specifically) that can dramatically improve in 2015. It’s going to be a priority. So much so — don’t be shocked if some of Seattle’s later round picks or UDFA’s carry specific special teams qualities. Lance Zierlein and Chad Reuter have also put together a seven-rounder for Seattle. They have the Seahawks taking Hroniss Grasu at #63, Tre McBride in round three and of course Ty Montgomery is a fourth round selection. Both scenarios make a lot of sense. The Seahawks can take the big receiver early and address a defensive need (or even running back) in round three because the depth is so good on the O-line this year. Yet if the options at receiver don’t match up at #63 (and a trade up isn’t possible) taking the top offensive lineman on your board in round two makes just as much sense. Grasu is intelligent, athletic and just a really solid prospect. You have to be comfortable with the injury history (could be a difference maker given Max Unger’s health issues) but nobody is going to be left scratching their heads if the Seahawks take Grasu at #63. McBride isn’t a big, physical mismatch like DGB or Funchess, but he’s ultra-competitive, wins the contested catch, is certainly athletic enough with special teams value and he’s a great character guy. You can easily imagine both players in Seattle. These two seven-round mocks are a further example of that situation. I think we’ll almost certainly see a power running back drafted in rounds 3-5 (neither mock has considered that scenario). Mike Davis remains an option. It’s interesting that in some quarters he’s rated as high as a third rounder — and yet Bob McGinn’s poll of scouts had him outside the top-12 for the position. If the Seahawks can get him in round four — keep an eye on that. With Todd Gurley now expected to go in the top 10-15 and Melvin Gordon likely to follow, we could see the entire class jolted upwards slightly. The Seahawks have had a lot of success finding cornerbacks in the fifth and sixth round range. They’ll surely add a corner at some point — but it’s probably unlikely to be early unless a big name suffers an unexpected fall. It was good to see SDB favorite Damien Swann projected to Seattle in Norris’ mock. He lacks ideal arm length but he’s a real playmaker. A heads-up for the rest of the week. We’ll have a podcast on the blog on Tuesday, with a final mock draft on the Wednesday. I’ll probably do two rounds and cover rounds 3-7 for the Seahawks. On Thursday I’ll be doing a live Google Hangout for the third draft in a row with Kenny and the guys at Field Gulls. There were four trades in round one. The Baltimore Ravens now own the #41 pick (from St. Louis) and the Green Bay Packers are at #35 (from Oakland). I haven’t included trades in the second round because there’s a danger things become too convoluted. We saw a cluster of second round deals a year ago and that could be the same this year. It means the Seahawks stay at pick #63 even though I think there’s a reasonable chance they’ll try to move up. There’s a significant drop off in talent from around #48-55. The quality depth on the offensive line in the mid-to-late rounds could also encourage a move up the board. Without trades this projection forces us to consider a scenario where a move up isn’t possible. It doesn’t stop us, however, considering some of the possible trade-up targets that might be available. In this mock the Titans acquired Philip Rivers and drafted Breshad Perriman. Adding a right tackle completes the revolution on offense and sets Tennessee up for a bounce back year in 2015. The Buccs could consider moving back into the first round to get a tackle. They need to protect Jameis Winston. They have enough weapons at receiver, now it’s about the O-line. Just a terrific football player. Not as athletic as his brother in Philadelphia but a cornerstone prospect who will set the tone on defense. They don’t have a playmaker at running back. If they go defense in round one this appears likely. They have to keep building around Blake Bortles. Terrific football player who finishes off a formidable looking defense in New York. Could easily be a first round prospect. They have many needs. Having gone for a big athletic corner in round one, they add a big athletic tackle prospect here. He’s being tipped to be the first safety off the board. What’s happening to Landon Collins’ stock? Having traded down from #26, the Ravens answer their need for a big, athletic receiver. If he lasts this long the Falcons will be getting excellent value. Having missed out on Phillip Dorsett at the end of round one, New Orleans comes back for chunk-play specialist. They have to bring in a linebacker. This is a sweet spot for the position and a good time to address the need. I had a hard time placing him. I’m a huge fan of his potential but a broken foot at the LSU pro-day could push him down some boards. Imagine an offense with Mariota and Abdullah working the controls. That’d be really something. His tape isn’t as good as his combine display. He’s a bit overrated. KC see the value here. The Bills need to keep adding to their offensive line. Sambrailo is athletic and flexible and could play a number of spots. They still have a need at the position and Derby is athletic enough to provide real value in this range. I’m not a big fan personally but he’s the type of interior rusher the Bengals seem to like in their scheme. Massive college tackle with the skill set and size to project inside. The Lions could use him at guard or right tackle. Never really lived up to expectations at Alabama but Yeldon is big, long and scores touchdowns. The Panthers add a return man and a productive, reliable receiver for Cam Newton. After replacing Torey Smith at #41, the Ravens go about replacing Pernell McPhee. A little overrated after the Senior Bowl, Davis’ tape is pretty average. Still, he’d provide size to the Cowboys D-line rotation. The Colts add an immediate starter to their interior offensive line. He just seems like a great fit. Plays tough, reliable, safe hands, slightly cocky attitude. He’d be ultra-productive playing with Aaron Rodgers. Possible the best fit at center for the Seahawks, they take the top O-lineman on their board. Someone is going to take a chance on Coates’ incredible upside. He needs to do something about the drops if he’s going to work with Tom Brady. I still believe we’re looking at a scenario where the Seahawks either move up in round two or take the top offensive lineman on their board at #63. With Dorial Green-Beckham taken at pick #41, it’d take a big move to get him. You’re looking at a deal that possibly involves a fourth rounder and a 2016 third rounder. Seattle hasn’t been afraid to make big trades in the past and they’ve been known to give up third round picks (Charlie Whitehurst, Percy Harvin). It’s still a costly move. Alternatively they could move up a few spots using just a fourth rounder to target a different player. The Detroit Lions at #54 are a realistic trade partner. So why Mitch Morse if they stay put? It’d be a bit of a reach but so was Justin Britt a year ago. The late second round isn’t a great position to be drafting in this class. It’s another reason why they might be willing to move up. Morse’s stock has rapidly grown over the last few weeks. Daniel Jeremiah pointed out this week that if Seattle wants him they probably have to take him at #63. He isn’t going to last until the late third round. If you want a plus athlete with similar size to Max Unger, Morse is your guy. You let him compete with Patrick Lewis and Lemuel Jeanpierre, just as Britt competed with Eric Winston a year ago. Yes it’s a deep class for centers but do any fit Seattle better than Morse? He’s tough as nails, strong and athletic. He’s graded in the third round but certainly isn’t going to last until Seattle’s pick. You might suggest moving down before drafting him. I’m not sure you can risk it. Washington at #69 need a center and Scot McCloughan is going to be trying to rebuild that roster to match Seattle’s. In this range you’re really just taking the player you like the most. Morse has a shot to start for a long time, filling one of the biggest holes on the roster at a cheap cost. His relationship with Britt probably helps and retains some familiarity on a changing offensive line. The alternative pick I considered was Florida State’s Tre Jackson. Tom Cable went to the Florida State pro-day. He could’ve been watching Josue Matias. However, the Seahawks love size at left guard. Robert Gallery, James Carpenter, Alvin Bailey. All big guys with tackle experience. It’s hard to imagine they’ll draft a 300lbs-er for the position. Jackson is 6-4 and 330lbs. You’re looking at a really solid pure guard who just needs a little guidance. He’s an immediate starter. Morse gets the nod this week. We’ll do one more final mock next Wednesday. 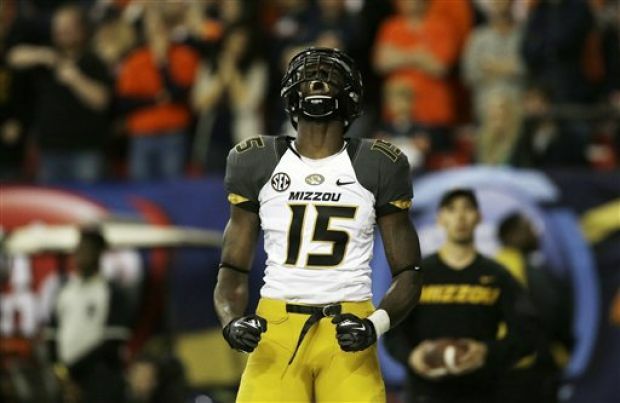 The Seahawks like Dorial Green-Beckham according to reports. Can they land him? We’ll get into the second round of our latest mock draft tomorrow. Today I want to focus on Dorial Green-Beckham. So there we go. Green-Beckham probably isn’t going to last beyond the first 15 picks of the second round. The New York Jets at #37 and the San Francisco 49ers at #46 could be a couple of teams to watch here. There are others. The Seahawks would have to make quite a jump to have any shot at landing DGB. Will they move up? Just yesterday John Schneider noted he has a lot of flexibility because the Seahawks have 11 picks in the draft. Last year the Philadelphia Eagles moved up 12 spots in round two to select Jordan Matthews for the cost of a fourth round pick. Seattle can make a similar move to get into the early 50’s. The question is — what else would they need to concede to move up a little further? ….there are general managers and personnel directors in the National Football League who claim Oklahoma’s Dorial Green-Beckham has the talent to become the finest in another stacked class of wide receivers if he can overcome his complex behavioral issues. That’s a minority viewpoint among scouts, to be sure, but the AFC man isn’t alone. That’s gushing praise even if it is a minority viewpoint as McGinn describes it. “At Oklahoma they vouch for the kid,” one scout said. “They loved the kid. His pro day was at Oklahoma (March 11), which kind of tells you what they thought of him. His receivers coach (Jay Norvell) was fired, and that was a big reason he decided to come out. It’s not insignificant that despite leaving Oklahoma without playing a single snap, DGB was invited to participate at the Sooners pro-day and was given 100% backing by the Head Coach Bob Stoops. Earlier this month, Green-Beckham and his girlfriend went to dinner with officials from a team they were visiting. In a separate article by McGinn yesterday, he ranked Green-Beckham as the #7 receiver in the class. One scout compared him to Josh Gordon — talented, dynamic but ultimately a headache waiting to happen. There are going to be teams who’ve already taken him off their board. There are going to be teams who are prepared to take him — but only at a certain point in the draft. That’s probably within the first 15 picks of round two as Pauline discussed. The Seahawks love field-tilting ability and DGB has it in spades. They’re also willing to take a chance. It’s going to be very difficult though to move into the top-45 without a serious trade involving multiple picks. If they can’t move up for DGB, what do they do? They still have the option of trading up for another player. Detroit are light on picks — they have picks in rounds 1-3 and then nothing until round six. They are probably looking to acquire a fourth or fifth rounder and they can do that by moving down from #54. This could be a target range for the Seahawks. If they stay at #63 all signs point to taking the top offensive lineman left on their board. I suspect they’d be very interested in moving up for the right player. But who — if it isn’t Dorial Green-Beckham? Don’t forget to check out DraftInsider.net for all the latest information from Tony Pauline — one of he best in the business.